Let me tell you a story. It's a winding tale of ups and downs of a horse and rider who have spent the last year and a half ironing out their game, and fortunately it's all mostly already been told. From the first AERC ride together after purchase and back soreness at Gold Country 2013 to the first RO at Chamberlain Creek, to the first 50 completion with back soreness at Derby 2014 and on to the RO at Gold Rush Shuffle 2014 for poor behavior (but no back soreness!). Not featured so prominently in those blogs because I really only care about my horse and have been battling it forever, are my migraine/heat issues that take me down at or after nearly every single ride. Endurance is called what it is for a reason, certainly. 30 January 2015 I got up at the crack of dawn to ride Azzaro at home. He wasn’t doing a ride for a few weeks but I was starting to leg him up slowly in preparation for a 40km sometime in the coming weeks. We rode up into the hills where we watched the sun rise over the Surfers Paradise high rises and filter across the long stretch of Gold Coast beaches. Then we climbed even higher into mountain goat country. I jumped off and climbed up the steepest sections to get some fitness for myself. Azzaro wasn’t training for the Quilty so it wasn’t necessary to make him carry me up but this climb was the perfect way for me to prepare my own fitness for Teddy. Azzaro did well and I was feeling great! Afterwards about lunch time I packed up my car and headed to my best friend Monique’s place to pick her up. We were on our way to the season’s first ride at Blackbutt, north of Toowoomba. Monique is now expecting… a very proud mummy to-be of a little girl so she wasn’t riding but was coming along to have some fun in the atmosphere she missed so much. She always looked after me so well and I often called her my “wifey” as she even knows me better than I do sometimes and we tend to fuss over each other a lot especially when our husbands aren’t around to do the fussing. At Blackbutt we would meet up and camp with Karen and Mick. They were bringing Teddy down so that I could do the 80km ride in an attempt to get him qualified as “Open” in preparation for the Tom Quilty in June. Karen was also collecting her new horse Pumpkin from the ride and doing her first 20km. We were all bubbling with excitement with so much to look forward to. This past weekend we did the "On The Edge" ride at Black Prong. On Thursday afternoon we loaded up Sudden, Errow and Jetta to go vet in for the following days 50. I would ride Sudden (of course, he's one of my favorite horses! ), Jeremy would ride Errow and Cynthia Peticulous would ride her horse Jetta (that we have at our house, in training). 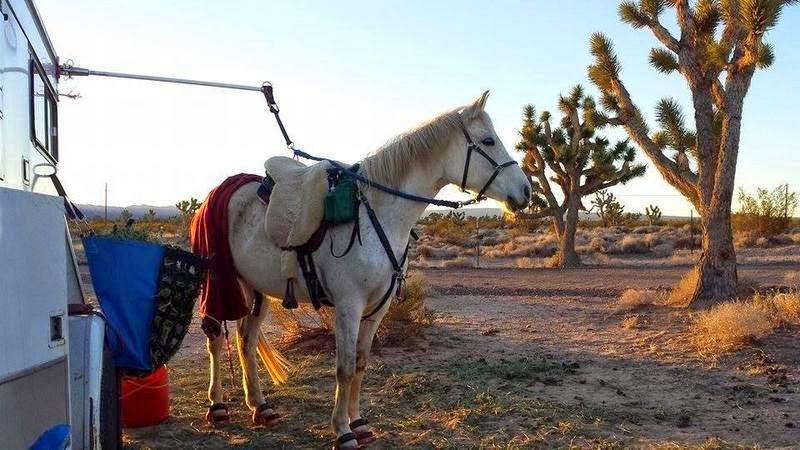 We put the horses in our small 4 horse to have a trailer to haul home and back during the weekend. It was calling for rain both Friday and Saturday so we also took our LQ so that while it was raining we would have a place to hang out during our holds. Lucky for us the race is only a 20 min drive. Just before we went over to the ride we realized that for the ump-teenth time our trailer wasn't charged. It had been plugged in but everything was dead... very depressing as we have recently had it in the shop several times for this very issue. We got the tractor and jumped the batteries so that we could operate the jack legs and put in the slide outs. We were taking this trailer come hell or high water! After the circus of getting both trailers road worthy we headed over to the ride. Cynthia met us over there and Jetta went to her rig for the night. I went and got our paperwork and then we vetted in Sudden and Errow. This was Sudden's second time at this venue and he seemed like he knew what was going on this time, he was so much more relaxed. Errow was cool as usual. They both vetted great.